This Southern British Columbia blend is punchy and intense. 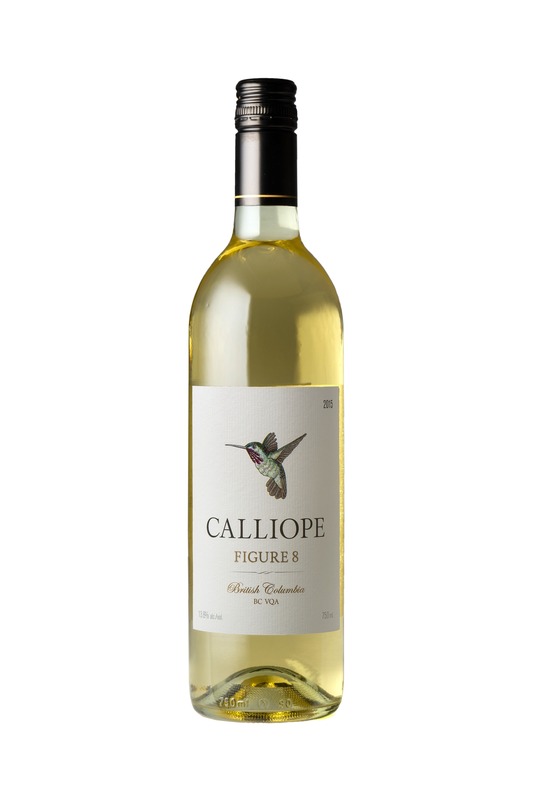 The nose shows ripe peach and apricot, floral jasmine notes and ripe cantaloupe melon. The palate has intense orchard and tropical fruits, a fresh cilantro note and a powerful refreshing racy lemony acidity that finishes with strong mineral, wet stone notes. Pair this with lemon chicken or grilled albacore tuna with fresh herb salad. The 2015 growing season was a grape grower’s dream come true. The long growing season started in April followed by unusual heat in June producing small, concentrated berries. The summer months allowed for even ripening followed by one of the South Okanagan’s “legendary” dry autumns. Warm days promoted the ripening process with cool nights to balance the ripeness with acidity. The grapes for 2015 Figure 8 White blend were harvested by hand in September and October 2015, as each variety had reached full maturity. They were processed and aged for 4 months separately. The Chardonnay portion was fermented and aged in barrel. After being blended, the wine was further aged in tank for 2 months to allow the flavours to integrate. It was then filtered, stabilized and bottled in June 2016.